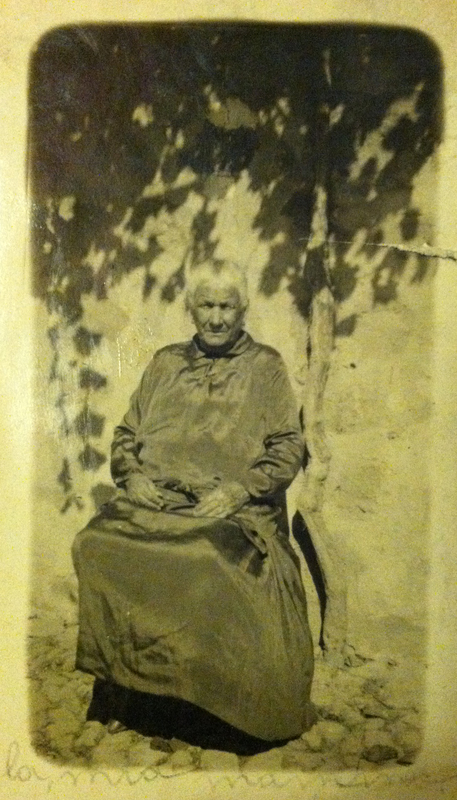 Yesterday, my cousin Elyse sent me some great photos of the Millonzi family that she got from her great-grandmother, Concetta, my great-grandfather's sister. Back Row (left to right): (1) unknown woman, (2) probably Concetta (Millonzi) Fiorella (1896-1994), (2) probably another Millonzi sister (possibly Lillie or Carmela), (3) unknown man, (4) family donkey. Middle Row (left to right): (1) Rosario Millonzi (1887-1971), (2) unknown, (3) Ignazio Millonzi (1846-), (4) possibly Phillip Millonzi. 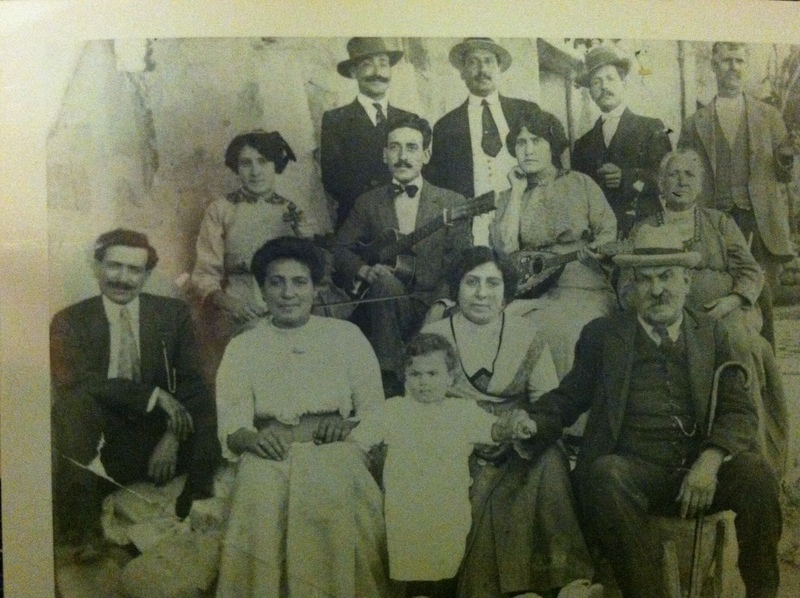 Front Row (left to right): (1) probably Giuseppe Millonzi (1873-), (2) Ignazio Millonzi (1884-1977), (3) unknown man and child, (4) Rosaria Salemi (1853-), (5) unknown woman. 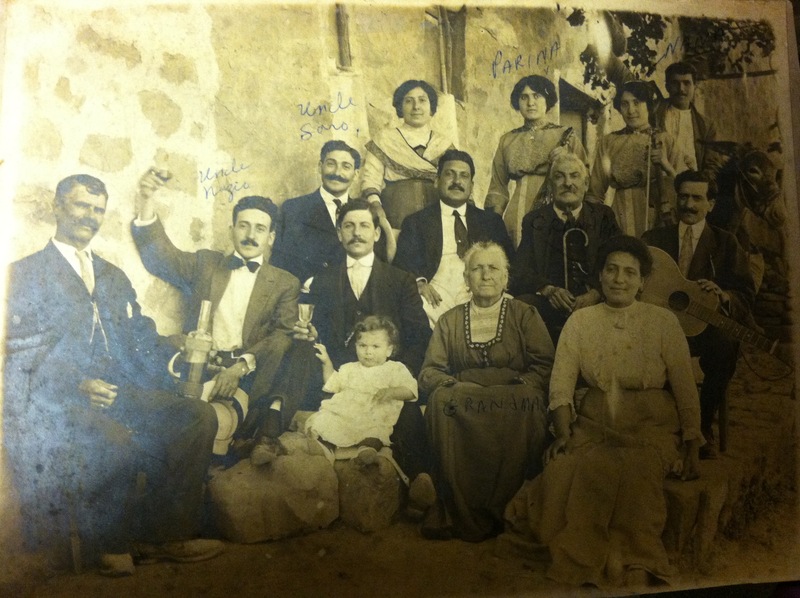 Back Row (left to right): (1) Rosaria Millonzi (1887-1971), (2) unknown man, (3) unknown man, (4) probably Giuseppe Millonzi (1873-). Middle Row (left to right): (1) probably Concetta (Millonzi) Fiorella (1896-1994), (2) Ignazio Millonzi (1884-1977), (3) probably another Millonzi sister (possibly Lillie or Carmela), (4) Rosaria Salemi (1853-). Front Row (left to right): (1) possibly Phillip Millonzi, (2) unknown woman, (3) unknown woman and child, (4) Ignazio Millonzi (1846-). My great-grandfather was a prisoner of war during WWI. He was captured during the the retreat from the Battle of Caporetto in northeast Italy and was a prisoner of war for 14 months in an Austro-Hungarian or German camp. According to family lore, he was so hungry he had to eat his shoes. My great-grandmother's family heard nothing of him after his capture. Her brother was a monseigneur and was able to get someone from the Vatican to track him down and check on him in the camp. When the Germans found out that my great-grandfather was a tailor, they took him off hard labor and had him make clothes for the officers. Soon after he was released, he emigrated to the US. Perhaps they have a record of him? It'll take 6-12 months to get a response. The IRC is digitizing their records. So no requests can be made until 2014. Mi dispiace. Scrivo un po' italiano. Mi potete aiutare a trovare i record militari per il mio bisnonno? Il mio bisnonno, Rosario Millonzi, è nato 27 settembre 1887 in Montemaggiore Belsito, Provincia di Palermo. La sua moglie era Carmela Parisi. I suoi genitori erano Ignazio Millonzi e Rosaria Salemi. Ha combattuto nella WWI (prima guerra mondiale). Era un prigioniero di guerra. Potete inviare i suoi documenti militari? Ho incluso una copia del mio passaporto. Avete bisogno di altro? Here is the response I received. Basically, it tells me to try this other office. 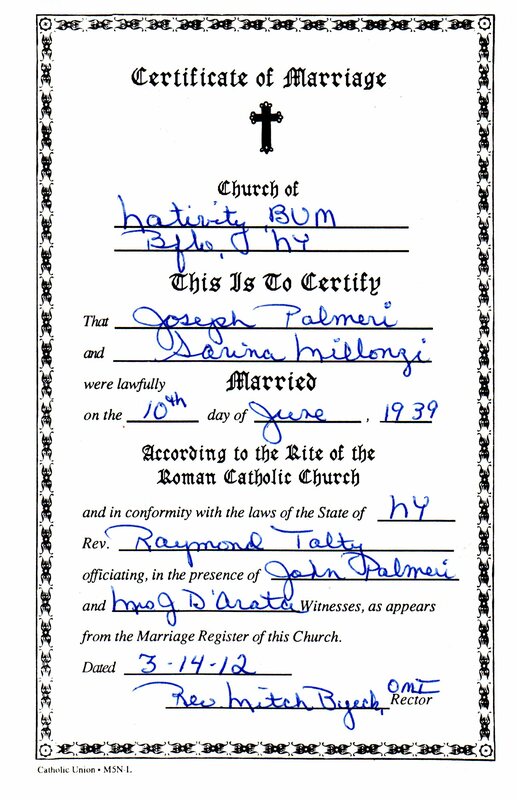 Here is my grandparents marriage certificate from Nativity of the Blessed Virgin Mary. They were married 10 Jun 1939. Witnesses were John Palmeri, probably one of my grandfather's Palmeri cousins, and Mrs. J. D'Arata, who I don't know. According to one of the churches that responded to my request to find my grandparents' marriage (they did not have it), her family church in Buffalo could have a record of her marriage: "If that was your grandmothers baptismal church, all her sacraments would be recorded there, under her maiden name, and also it would tell you the church your grandparents were married in." Desperate to find any possible leads on my grandparents' marriage, I emailed one of my cousins asking if he might have any idea where it could have taken place. He told me that my grandmother's parents' church was Nativity of the Blessed Virgin Mary on the west side of Buffalo. That church is closed and I would have never found it searching as I have. I emailed another church and they told me that the records for Nativity of the Blessed Virgin Mary are now held at Our Lady of Hope church in Buffalo. I emailed them. We'll see if they find anything. Fingers crossed that the Italian tradition was to get married in the wife's church. 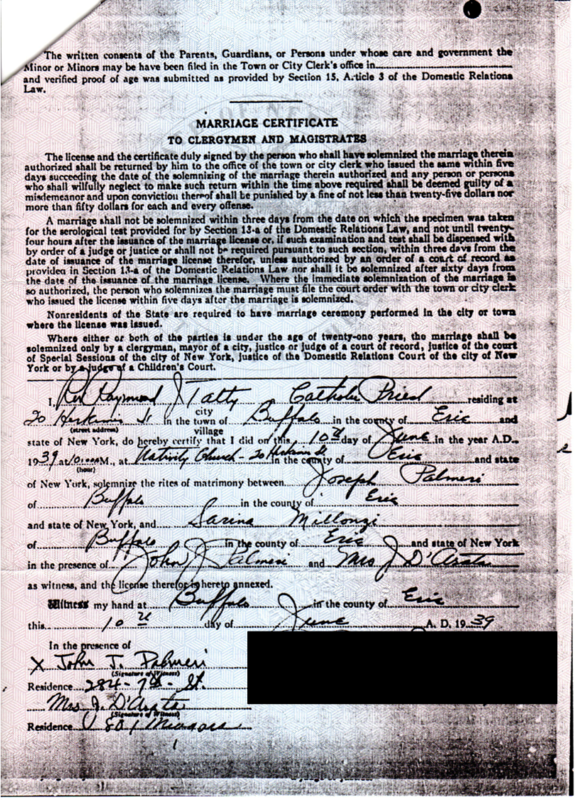 Today I received an email from Our Lady of Hope Church: "I found the marriage in our books and mailed out the certificate to you last week, probably on Thursday"
Okay, so no record was found in the City of Buffalo for my grandparents marriage abt 1939. I assumed it must have been in Buffalo since that's where they had lived their entire lives. But apparently not. 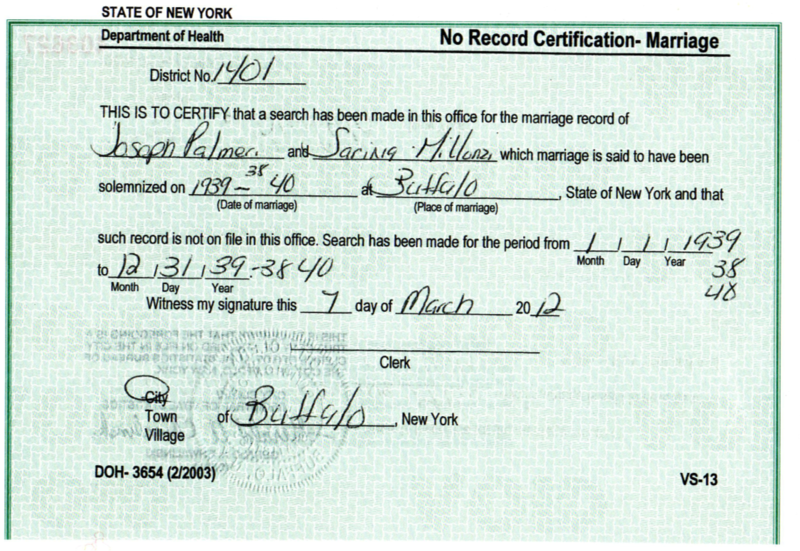 We'll see if my aunt can get a copy of their marriage certificate from NY State. In the meanwhile, I'll email and write the town clerks around Buffalo to see if any others can track down a marriage certificate for me. At least "no record found" is official (certified, with a raised seal). Perhaps the Detroit consulate will be okay with this. It's better than nothing I suppose. No records of the marriage of my grandparents were found at St. Anthony's, Holy Angels, Holy Cross, or Blessed Sacrament in Buffalo. I'm broadening my search to include St. Paul's, St. Mark's, St. Margaret's, St. Ann's, and St. Joseph's Cathedral. We'll see if any of them find anything. St. Margaret's – No. 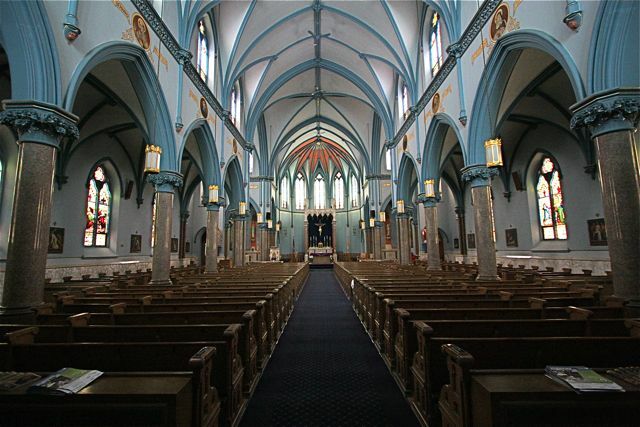 But the suggested St. Lucy Church (now closed – records are are at St. Columba-Brigid Parish – 716-852-2076 – 418 N. Division St., Buffalo, NY 14204) or Annunciation, Our Lady of Loretto or Nativity Parish (all are now closed – records are at Our Lady of Hope Parish 716-885-2469, 18 Greenwood Pl., Buffalo, NY 14213) or Holy Spirit Parish – 716-875-8102 – 91 Dakota Ave., Buffalo, NY 14216. One advantage of searching marriage records, apart from simply finding dates of marriage, is that it lets you confirm someone's grandparents. The marriage record for someone's parents lists the bride and groom's parents. 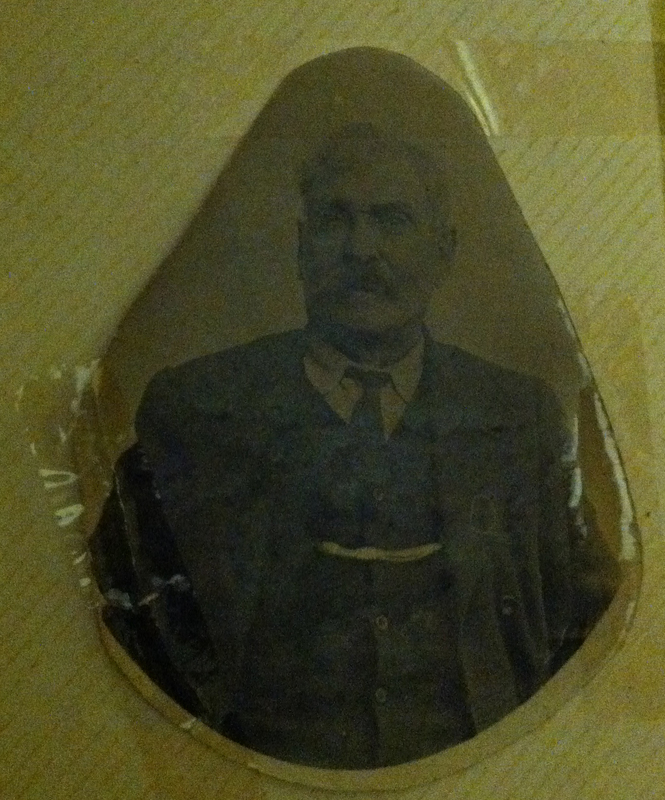 My great-grandfather was Rosario Millonzi. 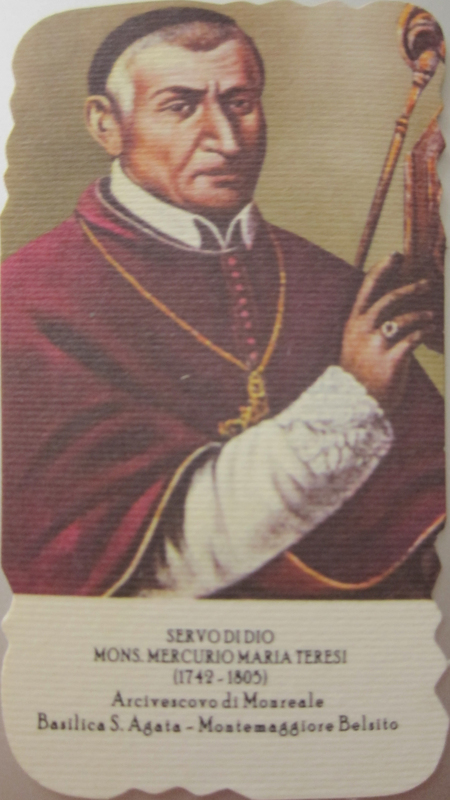 His parents were Ignazio Millonzi and Rosaria Salemi. 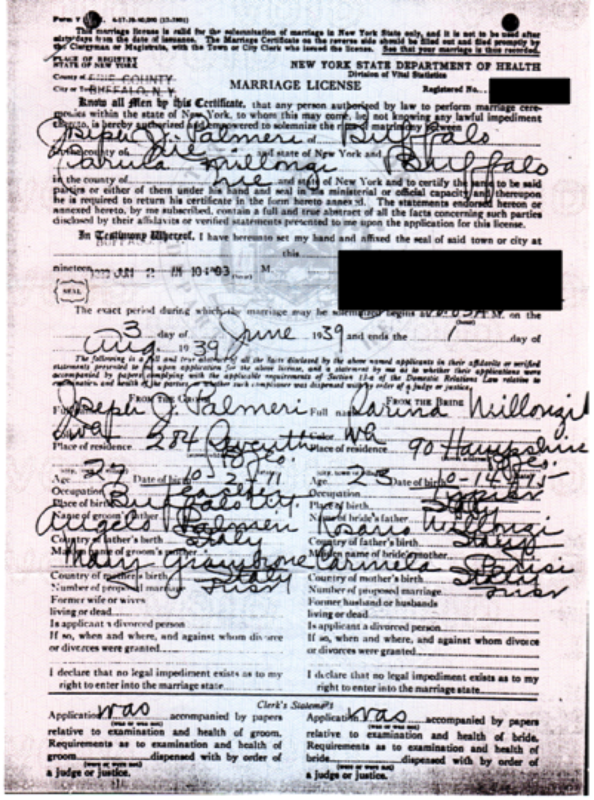 I had confirmed that earlier from his brother's death certificate, which I obtained from the City of Buffalo, and later found by great-grandfather's birth certificate. Today I found Ignazio and Rosaria's marriage record. 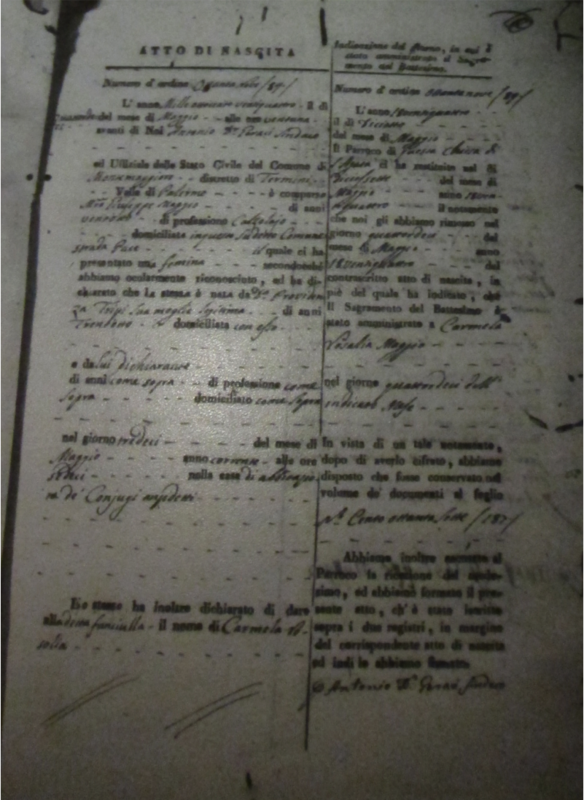 It lists Ignazio Millonzi's parents as Cruciano Millonzi and Filippa Teresi and Rosario Salemi's parents as Maestro Giuseppe Salemi and Carmela Maggio. From my great-grandfather's birth record, I knew the approximate birth date for my great-great-grandfather, Ignazio, because it listed his age at the time of Rosario's birth. 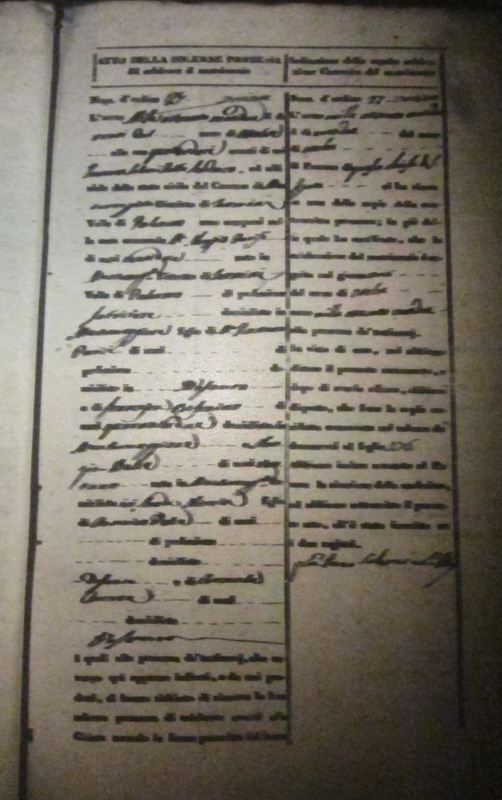 Sometimes the birth record also lists something like "Ignazio figlio di Cruciano" or "Rosaria figlia di Giuseppe", noting the father but rarely ever noting the mother. 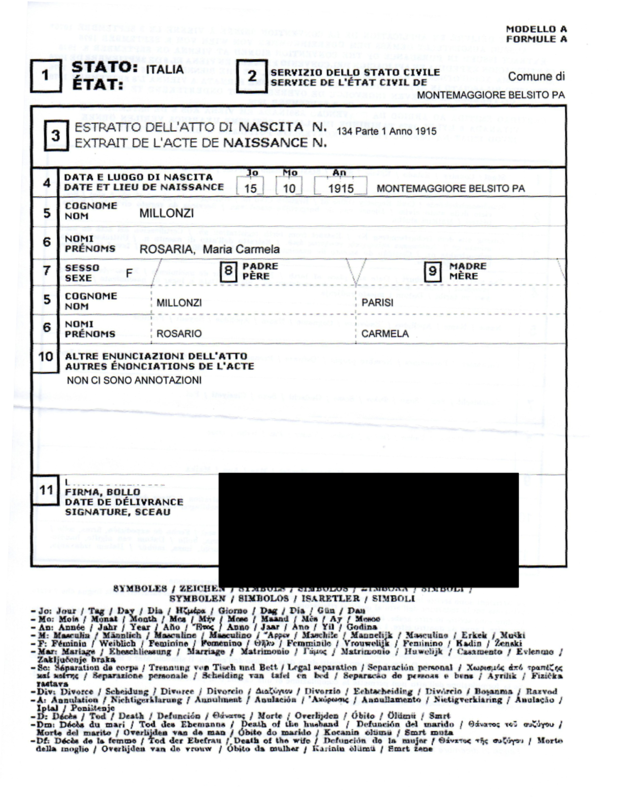 In the case of Rosaria, there was only one birth record with a "Rosaria Salemi" abt 1853, so I knew fairly confidently that her parents were Giuseppe Salemi and Carmela Maggio. In the case of Ignazio, I was able to pinpoint the birth year and thought his father might be Cruciano. 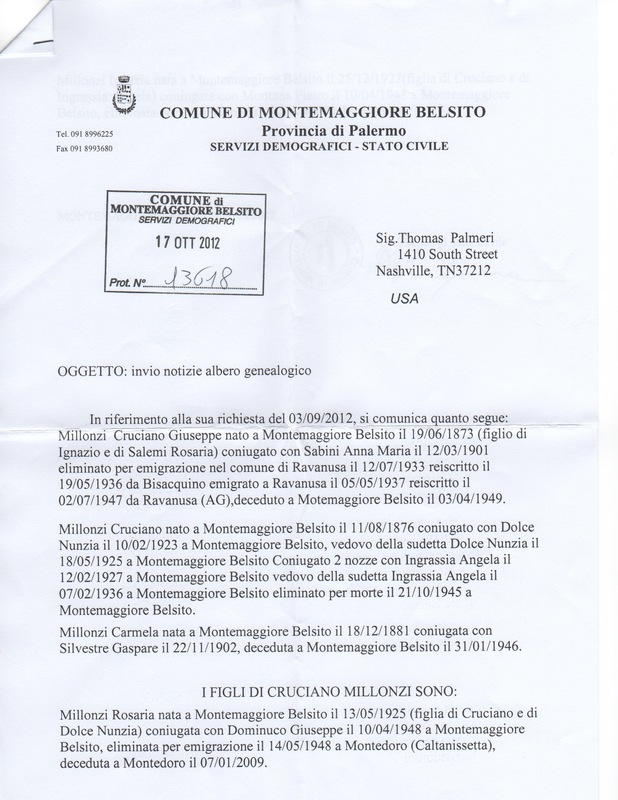 But when I searched the Montemaggiore records, I found two possible sets of parents, with the same father's name but two different mother's names. 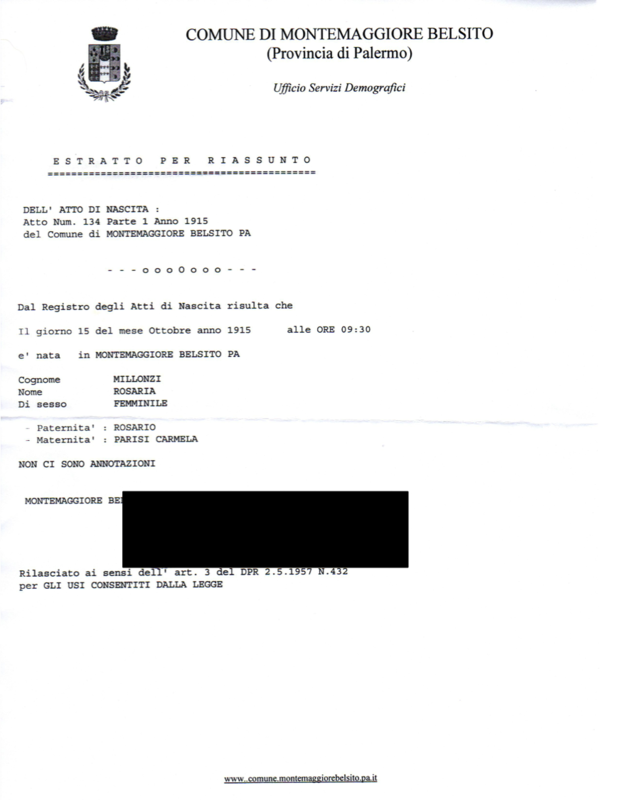 It was only by finding the marriage certificate, which lists the couple's parents, that I was able to confirm that Cruciano Millonzi married Filippa Teresi. In poking around microfilm shipped to the local LDS church, I found some of my most distant Italian ancestors so far. 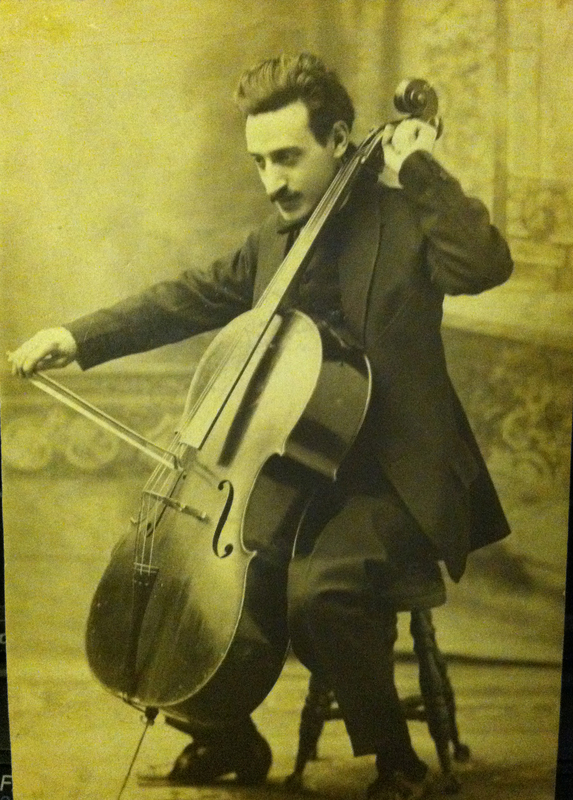 My great-grandfather was Rosario Millonzi (1887-1971), his mother was Rosaria Salemi (1853-), her mother was Carmela Maggio (1824-), and her parents were Maestro Giuseppe Maggio (abt 1803-) and Providenza Tripi (abt 1808-). Those are my great-great-great-great-grandparents. 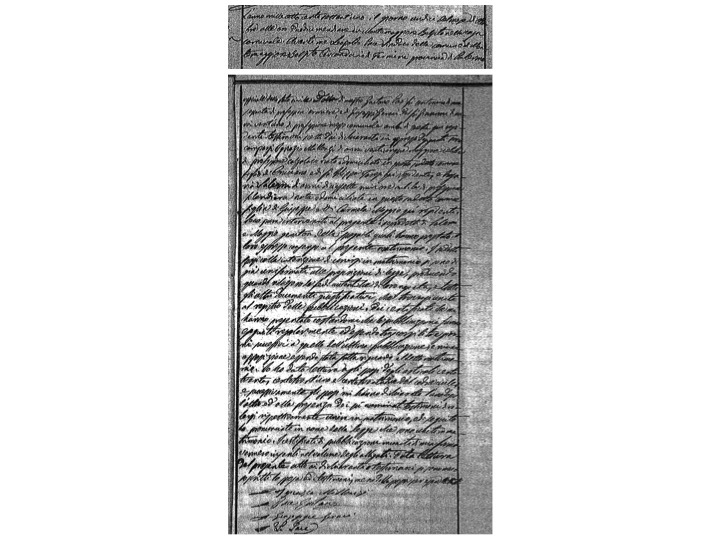 Here is a snapshot of Carmela Maggio's birth certificate from 1824. As I search LDS records for Montemaggiore Belsito, I am recording, in some way, all members of the Millonzi, Salemi, Parisi, and Sciolino families. 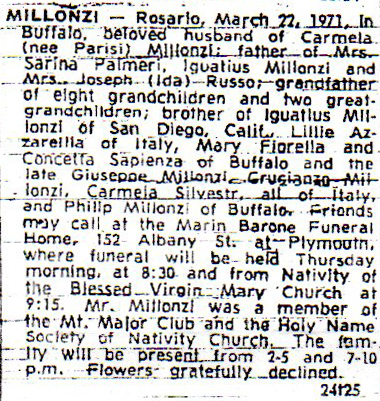 My great-grandfather Rosario Millonzi's parents were Ignazio Millonzi and Rosaria Salemi. 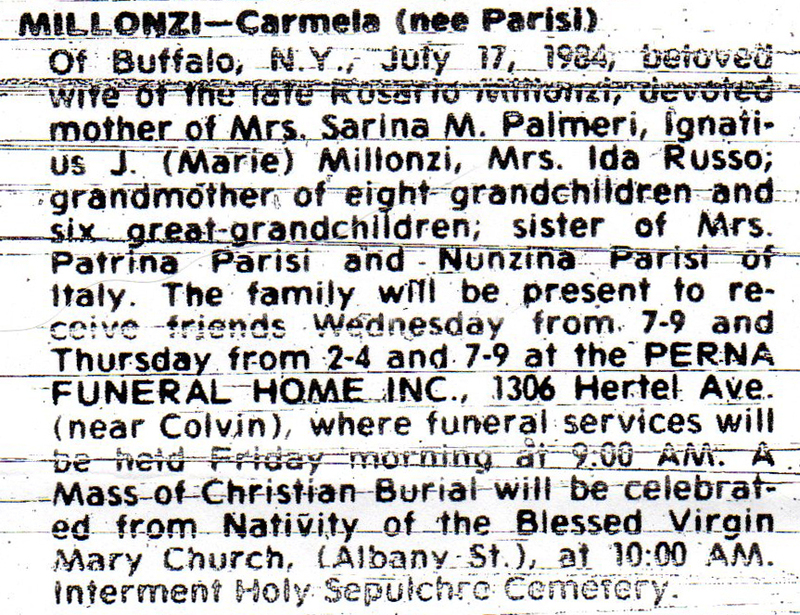 My great-grandmother Carmela Millonzi's parents were Angelo Parisi and Agata Maria Sciolino. 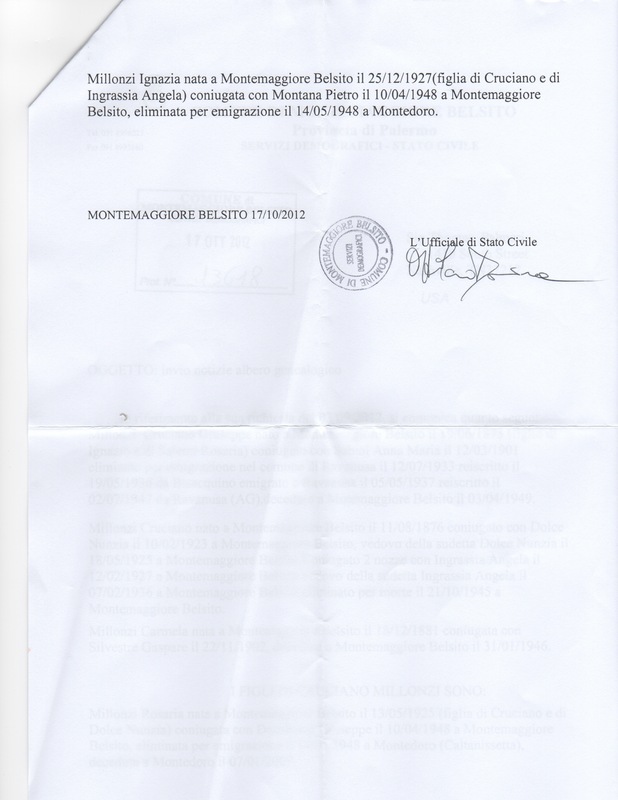 Maybe my efforts will be useful to someone else searching for their families from Montemaggiore. I make no promises for completeness or accuracy. In some cases, I could not read the stylized hand writing. Click on the link below to access the transcriptions.